Inverness Caledonian Thistle blew away brave Edinburgh City at the second time of asking with an early second half goal spree. The Citizens came north seeking the biggest scalp in their 32-year history, against the perpetrators one of the greatest Scottish Cup shocks of all time, the February 2000 beating of Celtic. But despite Blair Henderson’s early leveller, there never really looked like being an upset last night. The victory booked John Robertson’s men, the 2015 winners, a distinctly winnable fourth round tie at home to East Kilbride. 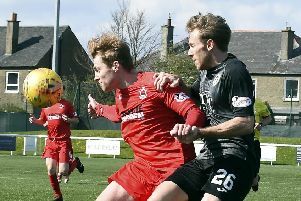 The Capital outfit had earned the second crack at the team from two leagues above after Liam Henderson’s late equaliser at Ainslie Park had cancelled out Shaun Rooney’s first half finish. Caley Thistle, smarting after losing their 25-game league unbeaten run to Falkirk on Saturday, made two changes. Midfielder Charlie Trafford replaced injured Sean Welsh, while striker Jordan White earned a start in place of benched George Oakley. If late goals had cost Caley Thistle recently, early ones were the order of the day in the replay. City, with 14 wins from their last 17 matches, were not short of confidence having already beaten Championship opposition in Alloa this season in the Irn-Bru Cup. Even when Inverness took a fifth minute lead, they weren’t to be rattled. A weighted ball over the top from Aaron Doran found Walsh shrugging off the challenge of City defender Liam Henderson before stabbing in a close-range finish. Thoughts of an evening stroll for the hosts quickly dissipated. Within two minutes, City’s Graham Taylor had hoisted a lovely cross into the box for Blair Henderson to steer a first time side-footed volley past the exposed Mark Ridgers. It was scorer Henderson’s 20th goal of the season. For a few minutes, the home side were flapping and it took a very good full-stretch block from Caley Thistle defender Jamie McCart to stymie another Blair Henderson strike. But the home lead was restored after 15 minutes, with White guiding a header past keeper Calum Antell from Liam Polworth’s long free-kick from the left. Walsh hit the roof of the net with a clever chip and White knocked a header wide of target as Caley Thistle held the upper hand through the rest of the first half. But City always looked assured on the ball and in sweeping counter-attacks, without further troubling Ridgers before the break. Joe Chalmers had a good chance, but struck meekly wide on the volley from Doran’s supply five minutes after the re-start. But the hosts began to make their overall dominance count with a crucial third goal after 53 minutes. Coll Donaldson’s run and Polworth’s telling pass set up Walsh for his second of the night, executed with a superb, controlled finish from the angle into the corner of the net. White then struck twice within two minutes to kill the tie and claim a hat-trick, first with a clinical volley from Rooney’s cross and then with a deft head-flick close in on Polworth’s cross. By now, the Highlanders were cruising, threading passes around the pitch and blooding teenage talents Roddy MacGregor and Cameron Harper for valuable first team experience. City’s heads were down and they were clinging on but they battled manfully to resist further damage, with 17-year-old MacGregor proving a lively handful to the minnows. MacGregor twisted and turned neatly outside the penalty area in the closing minutes, setting up Walsh for a dig for his hat-trick which flew harmlessly into Antell’s arms. A rare City effort late on saw Blair Henderson’s header spin well wide from Adam Watson’s decent cross from the left. But the sixth arrived after terrific skill from young MacGregor surging forward before slipping a through pass into the path of Doran for a low left-foot finish. Inverness CT: Ridgers; Rooney, Donaldson, Mckay, McCart (Harper 68); Chalmers, Trafford; Walsh, Polworth (MacGregor 64), Doran; White (Austin 78). Unused subs: Hoban, Oakley, Nicolson, Brown. Edinburgh City: Antell; Thomson, Balatoni, L Henderson, McIntyre ; Shepherd (Hall 80), Black (Watson 48), Laird, Taylor; B Henderson , Smith (Rodger 64). Unused subs: Morton, Beveridge, Lumsden.